In the weeks leading up to Christmas, the declaration “There’s no snow!” was a steady refrain uttered amongst several of our local friends. They weren’t talking about London, which hardly ever sees the stuff anyway; they were talking about the Alps. From Les Trois Vallees to Zermatt, Courmayeur to St. Anton, El Niño and his wacky water-warming patterns were creating unseasonably high temperatures across Europe, thwarting Britons’ dreams of snowy Christmas ski holidays. Being pretty unwise, still, to the vacation patterns of our adopted brethren, we had planned our own mini-break during the holiday – not to France or Switzerland, but to Norway. The flights from London to Bergen, Norway’s second city, were reasonable, and we could do a combination city/ski break by taking the train to Geilo, a ski resort halfway between Bergen and Oslo, on the Bergen Railway. Visions of Lapland danced in our heads, and we scheduled dogsledding and ice skating with the skiing to round out our wintry holiday celebration. Maybe we’d even catch a glimpse of those legendary Northern Lights! 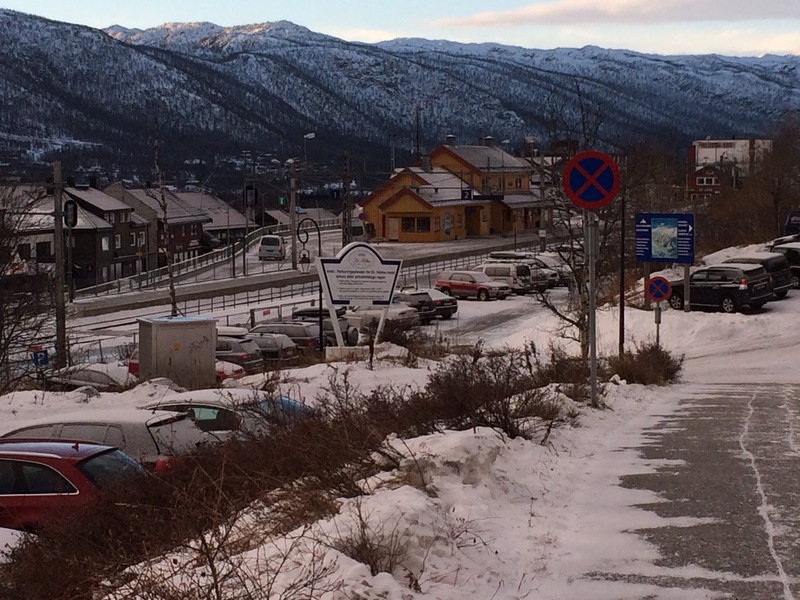 After 24 wet and windy hours in Bergen, soaked to the gills, we caught an afternoon train to Geilo. Hailed by many as being one of the most beautiful train journeys in Europe, the trip isn’t quite as scenic in the pitch dark, which is the lighting situation in Norway after 3 PM in late December. Nevertheless, aboard the train, staring out at pinpricks of light dotting the shadowy mountainsides along the route, it gave me a delicious thrill to pretend I was in a scene from a Nordic-noir novel (Anne Holt’s 1222 sprang to mind first). Adding to the ambiance were the howls of wind that screamed throughout the cabin whenever passengers opened the through-doors between cars. We were crossing one of Europe’s highest mountain plateaus, the altitude of which even disrupted the functionality of the debit card reader when we tried to buy goodies in the snack car. After the three-hour journey, we arrived in Geilo. It was the Saturday before Christmas, and the station was quiet. The village itself is characterized more by modern glass-and-wood-clad buildings that run along a main thoroughfare, rather than by cobblestone alleyways radiating out from churches and courtyards that we’d seen further south in Europe. 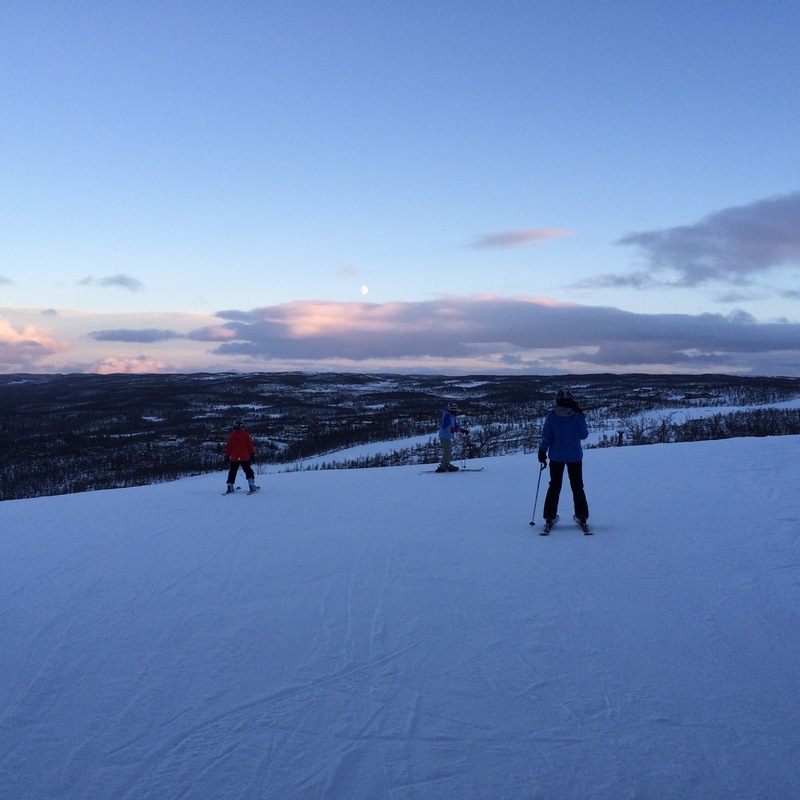 The weather was practically balmy; even this close to the Arctic Circle, Geilo had not escaped the spell of unseasonable weather that had left much of ski-able Europe devoid of snow. But a blanket of slush, snow, and ice covered the ground, which made us excited about conditions for the winter activities we’d planned. It also made for lots of bitching, whining, and cursing quietly as we dragged our trusty wheely suitcases along the five minute walk to the hotel. With great relief, we saw our accommodations rise before us: the sprawling and majestic Dr. Holms Hotel. Here are some interesting facts about the Dr. Holms: It was built in 1909 by one Dr. Holms, a pulmonologist, and was originally intended as a sanitorium for patients suffering from respiratory ailments. Built in what Americans call the Colonial Revival style, the architecture is characterized by a large, central 4-storey structure with east and west wings. Made of wood, the entire building is painted white, and fronted by a graceful porte-cochere, and each of the sections is topped with coppery hipped roofs. You know what else was built in 1909, was originally intended as a sanitorium, and is a humongous white hotel with a copper roof? The Stanley Hotel, which any Stephen King fan knows was the inspiration for The Overlook Hotel – the fictional setting for that American classic, The Shining. I tried not to think of Big Wheels and Redrum as we checked in and marched down an endless carpeted hall to our room (thankfully, not #217). Thoughts of isolated mountain hotels fled my mind once we unpacked, because it was time for dinner, and we had a reservation at Ekte, a TripAdvisor favorite in town. We headed back down the icy path into the village, arrived a few minutes early, and found ourselves the only ones in the entire restaurant. Jeff and I looked at each other in alarm. First the monsoons of Bergen, now this? What the hell were we going to do in a mountain town in Norway in the rain? A moment later, in a particularly wanton act of cruelty by the fates, my phone buzzed with a new email message. It was Geilo Husky, the dogsledding operator, letting me know that the track had been destroyed by the wind and rain and our 5k dogsledding tour would be cancelled the next day. Visions of Jack Nicholson’s “Heeeeeeere’s Johnny!” scene crept into my mind, but now it was time to peruse the menu. Reindeer was a top selection, but since we’d come to see Rudolph, not eat him, we decided on regular cow steak instead, and burgers for the kids. I’m not sure how a meal that sounds so simple was able to send our spirits soaring, but it did. Maybe it was the tangy peppercorn dressing that came with the steak. Maybe it was the fact that we’d finally dried off from the Bergen portion of our trip. Maybe it was the light banter and gracious assistance of our server, who talked of life in Geilo, her daughters’ ski racing hobby (they really are born wearing skis in Norway), or maybe just her quiet sympathy when we described how drenched we’d gotten in Bergen (which she totally understood, because she was originally from Bergen). Maybe it was the Malbec. (It usually is.) Whatever it was, we left the restaurant feeling completely restored, and ready to face whatever the Norwegian weather had in store over the next few days. The next morning dawned (at 9 AM) clear and cold. No rain! No fog! Just pure, clear, cold mountain air, and views for miles. These mountains didn’t jag and spike up into the sky, like the Alps; they rippled gently across the horizon, leaden brushes of evergreens striping their pillowy ridges. The Scandinavian Mountains are geologically continuous with those of Ireland, Scotland, and the Appalachian mountains in North America; geologists hold that all these formed a single range prior to the breakup of the ancient supercontinent Pangaea. In other words, Geilo’s mountains were the not-so-distant relatives of the Poconos I’d started feeling so confident on a couple years ago. Since dogsledding was out, we opted to hit the slopes. And for this “timid intermediate,” what glorious skiing it was. The runs are well-groomed, and are generally much more easygoing than the Alps. I didn’t get that customary jolt of terror when I arrived at the top of the run; even better, I seemed to have retained everything I learned during last year’s ski trip. This early in the season, the runs were practically empty, so no vying with crowds and dozens of ski school students for space to practice turns. I even skied a red trail, for the first time in my life. As for the Dr. Holms: despite its similarity to the scariest setting in history, it has had, in the past, a reputation for being one of “the” places to stay in Southern Norway. But the comfortably worn condition of the rooms and hallways, and a general feeling of down-to-earth camaraderie among the guests and staff alike, make for an unintimidating and welcoming experience. Plus, the hotel has, literally, EVERYTHING onsite: a café; a dining room, in which breakfast and dinner are served every day; an American-style diner with attached bowling alley; a tapas restaurant, Escalon (which was amazing – unlike the equally fabulous Bare Vestland in Bergen, which served Norwegian tapas, this one served Spanish tapas and great wines). Ski equipment rentals were coordinated through a service in the basement of the building, and the chairlift for the Slaatta Ski Center was a 2-minute ski from the hotel. There was a beautiful pool/spa area with a wall of glass doors leading to a hot tub in the snow outside, and the kids instantly got into the habit of changing from ski gear to bathing suits every afternoon. Also in the hotel: a quiet library with a fireplace, which I could imagine myself sitting in with a cup of tea and a good book, staring out at the mountains; and a rustic-chic après-ski bar with glass-enclosed central firepit, where it would have been really nice to have a drink. As it was, though, we spent too much time outside enjoying the winter magic to really take advantage of the interiors. (Besides, we had those two bottles of wine from the Duty Free at Heathrow – why forego those for a bar tab that would probably set us back a couple hundred bucks?) We never saw Rudolph, and we didn’t catch a glimpse of the Northern Lights. Norway is cold, dark, and expensive. But there was something incredibly warm about this unassuming mountain retreat, and, best of all, I finally felt at ease on skis. That’s enough to create a lasting glow.